This tutorial assumes you're familiar with the Oanda platform and know how to make a trade on it. If not, see the tutorial Making Your First Trade. The first step is to open the trading platform and set it up the way you prefer. Next, decide which currency pair you want to trade. In this tutorial, you'll initiate the trade order using trailing stops. Trailing stops are selling or buy orders that close out the trade and follow the market price up and down by either a percentage or a fixed number of pips, the usual forex term for points. In either case, the quantity referred to is the minimum amount by which an order may change. For U.S. denominated currencies this equals 1/100th of one percent. Trailing stops are an essential risk management tool for forex traders. They allow your winning trades to run while providing a stop order that keeps adjusting upward as the market price improves. Open the market order window and set up your trade. 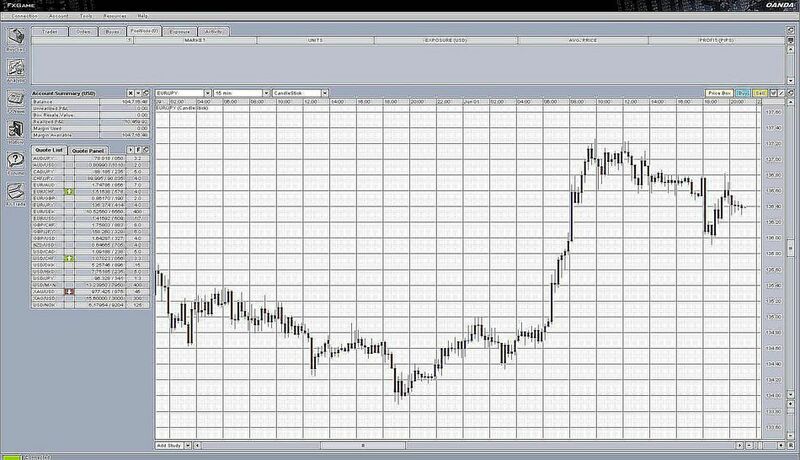 In this example, the trade order is for the currency pair AUD/JPY at a market price of 78.15. Now check the box that says "Trailing Stop." The trailing stop can usually be set anywhere; in the tutorial, the stop is set at 78, 15 basis points behind the current market value and a relatively tight stop. Note that although you can usually specify a trailing stop to trail the market price by whatever amount you want, occasionally -- and particularly in instances where the buy/sell spread is wide or widening -- brokers may not accept trailing stops set very close to the market price. Note also that there is no one "correct" amount the trailing stop should trail behind the market price. Day traders might use a 15 pip stop, while a swing trader might set a wider stop and a long term or position trade might set a wider stop -- one, for example, that is about three times larger than the average daily price range. Another way of looking at setting the appropriate trailing amount is to consider the largest loss you can tolerate on the one hand and the other the likelihood of a tight trailing stop resulting in your being sold out by an inconsequential market swing. Now, just allow the trade to take its course. The trailing stop will take care of the exit on this trade if the price declines. If it does not your winning trade continues to run. In this example, the market moves in your favor and trailing stop move upward with it. For the Oanda trailing stop, once the market price moves past your entry point plus the cost of the spread, the stop will move upward one tick for every upward tick in the market price. Here, the trailing stop has moved to 78.05 as the market has moved upward. In this example, the market price declined and the trade has been stopped out at 78.08 for a loss of 7 pips. While it's never fun to see your trade stopped out, the Trailing Stop has done its job and your losses have been limited.